After Southern Sensational Superstar Rajinikanth’s KOCHADAIIYAAN, India’s first High Tech Animated and Photorealistic performance capture film, it seems Bollywoood superstar Shah Rukh Khan is vying to tie up with Virzu Studios’ ATHARVA - THE ORIGIN, based on an animated new age graphic novel of the same name. The official trailer of ATHARVA - THE ORIGIN which was released recently on YouTube has taken the cine buffs by storm. 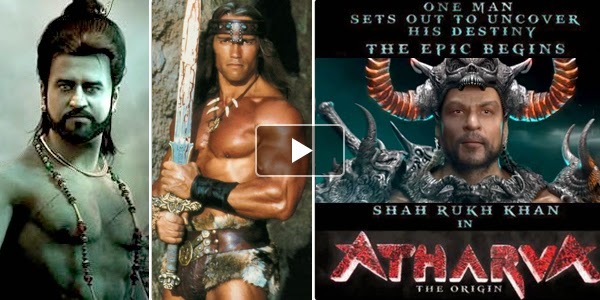 The trailer depicting Shah Rukh Khan portraying a pre historic King in the typical avatar similar to Arnold Schwarzenegger in the Hollywood hit film CONAN THE BARBARIAN, with a muscular body and primitive armours is widely being appreciated. Viewers are going crazy and the social media is flooded with comments like WOW!! It's amazing I can't wait to see this movie! Adapted from Ramesh Tamilmani's graphic novel, ATHARVA - THE ORIGIN’, is a mythological drama that tells the story of a King and his victory over the evil. In nut shell the movie will take viewers to the glorious manors of ancient era, weird beasts and fairly land scenic locations that are forte of such fantasy tales. ShahRukh Khan, is known for experimentation and has even played King ASOKA, an Indian epic historical drama directed by Santosh Sivan. Further he is even acquainted about Animation and VFX technology with his home production RA.ONE. Though official confirmation of the tie up between Khan and Virzu Studios has not been confirmed yet with film buffs excitement and superlative response, probably Virzu Studios and Shah Rukh Khan’s home production Red chillies entertainment might adapt ATHARVA - THE ORIGIN and can make an extravagant epic with high class VFX akin to Hollywood productions.